Octane can be a blast to play if you know how to efficiently use his abilities. Apex Legends Season 1 brought to the table a brand new character known as Octane. Described in-game as a “High-Speed Daredevil,” Octane looks like a mix between Overwatch’s Junkrat and a Psycho from Borderlands 2. At least, as far as his overall visual design is concerned. But while his appearance may not be particularly original, his abilities are an entirely different story altogether. This is a high risk high reward character that favors hit-and-run tactics thanks to his kit, which revolves around speed and mobility. In the hands of a skilled player, this adrenaline junkie can be very difficult to eliminate and can easily outrun any other character in Apex Legends over long distances, including other speedsters like Wraith and Bangalore. As with most new characters in any multiplayer game, learning how to use Octane properly takes some getting used to, but don’t worry because this quick guide will help you get started on the right foot. Keep in mind that the character was just added to the game so everybody is still trying to figure out how to make good use of his abilities. However, simply knowing how his abilities work and when to best use them will certainly give you an edge on the battlefield. Octane’s Stim ability allows him to move 30% faster for 6 seconds at the cost of a portion of his health. The ability only has a two-second cooldown so you can pretty much spam it all the time and zip across the map either pursuing or running away from opponents. Octane loses 10 HP every single time he uses this ability so you’ll want to be careful when using it because the damage can quickly stack up if you’re not paying attention. The speed boost is comparable to Bangalore’s passive ability but is arguably even more useful as players can actively decide when they want to take advantage of it. Stim is a very helpful tool to use when you’re stuck outside the circle, particularly in the early stages of the game. Using it in the late game to get back inside the safe zone is also a viable option but keep in mind that you lose 10 HP every time you use it and it can easily put you in a tough spot if you don’t manage it properly. Stim can also be useful to counteract the effects of other abilities and certain items found in Apex Legends. Slowing effects, in particular, are a lot less effective against Octane when compared to other characters, though you’re definitely not entirely immune to things like Arc Stars or Bangalore’s Artillery Strike. 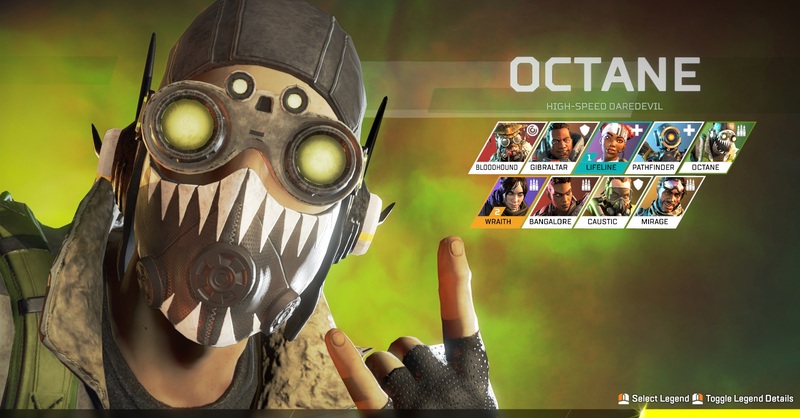 Octane is the second character in Apex Legends with self-healing, however, his ability works a bit different than Lifeline’s D.O.C. Drone. Swift Mend restores 1 HP every 2 seconds whenever Octane is not taking damage, which nicely complements his Q ability. Although the passive life gain is not enough to offset the damage you take when using Stim, it does give you the option to confidently use your Q ability a couple of times in a row without losing too much health at once. 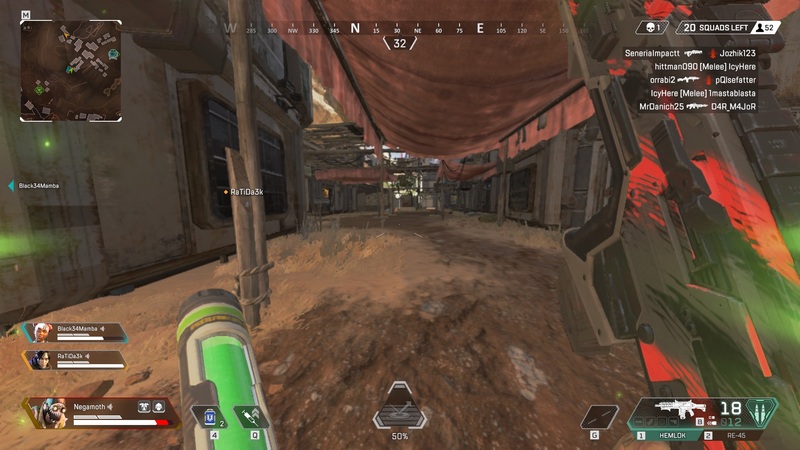 Just remember that you need to be out of combat to trigger Swift Mend so you should still be careful about using your tactical ability because in Apex Legends you never know when enemies might be nearby. Swift Mend makes Octane one of the most self-sufficient characters in Apex Legends because he doesn’t need to rely as much on healing items. A side benefit to this is that you can also ignore some of those Syringes you find all over the place and use the extra inventory space for something else. Octane’s Ultimate ability allows him to deploy a launch pad on the ground that launches players into the air like a trampoline whenever they step on it. This ability is similar to Wraith’s Dimensional Rift or Pathfinder’s Zipline in the sense that it can give a very nice mobility boost to your whole team. However, just like the aforementioned abilities, Launch Pad can also be used by opponents so you’ll want to carefully consider when and where you want to deploy it. Launch Pad is a very situational Ultimate that feels somewhat weak when compared to Octane’s other abilities. One on hand, you can use it to quickly get out of a sticky situation or to access hard to reach places. On the other hand, using the Launch Pad also has the potential to give away your position and make you an easy target for skilled players who are adept at shooting targets while they’re in the air. It’s worth noting that Launch Pad can also be used to catapult items such as grenades into the air, so you can potentially use this to your advantage in certain situations. Again, this is a fairly weak Ultimate all things considered but creative players can no doubt find fun ways to use it, especially when combined with different mobility-focused abilities from other characters in Apex Legends. Octane is available to purchase for 12,000 Legend Tokens or 750 Apex Coins. This is one of the high tier characters currently available in Apex Legends and definitely worth looking into.